Thinking about giving your bike an update with some new color, and you want to mix things up? 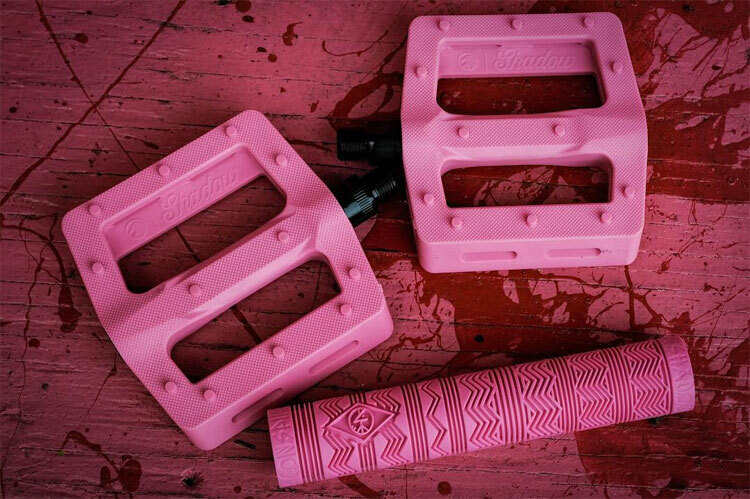 The Shadow Conspiracy have released their new Double Bubble Pink Colorway that is available on all of their Grips, Surface Plastic Pedals and Ravager Plastic pedals. This color is available through BMX shops and mail-orders that carry The Shadow Conspiracy worldwide now, or in the The Shadow Conspiracy webstore! Not sure how Double Bubble Pink might look on your bike? Get an idea of what it might look like in the BMX Color App! What do you think? Are you feeling the color or not so much? Let us know what you are thinking in the comments below! Note: This post contains affiliate links and we could receive a small commission if you were to purchase these grips or pedals direct from The Shadow Conspiracy! We would never recommend a product we didn’t think was a quality product. 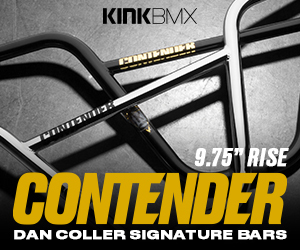 Thinking about picking up some new BMX Tires? Here’s a look at the new Serpent Tire that The Shadow Conspiracy just released for the riders looking for a lighter weight tire for ramp riding. The tire features a high thread count casing that allows for less rubber material, which helps reduce the weight. It has a custom engineered low profile, directional tread pattern with micro-knurling that’ll give you plenty of grip with low rolling resistance. The tire even squeeks for those of you who look for that feature in a tire. The Serpent Tire is available in two versions; Kevlar Folding Bead and a Traditional Steel Bead version. The Kevlar Bead comes in a 2.30″ size with a 110 PSI rating and a 14.6 oz. weight. You can find it in Black and Polar Pop Blue for $51.99 through The Shadow Conspiracy dealers worldwide now, or direct from the Shadow Conspiracy Webstore. The Steel Bead version comes in a 2.30″ size with a 110 PSI rating and a 18.9 oz. weight. You can find it in Black and Polar Pop Blue for $35.99 through The Shadow Conspiracy dealers worldwide or direct from The Shadow Conspiracy Webstore! What do you think of the new Serpent Tires from The Shadow Conspiracy? Did you have any questions? Let us know what you’re thinking in the comments below! Not quite what you had in mind? 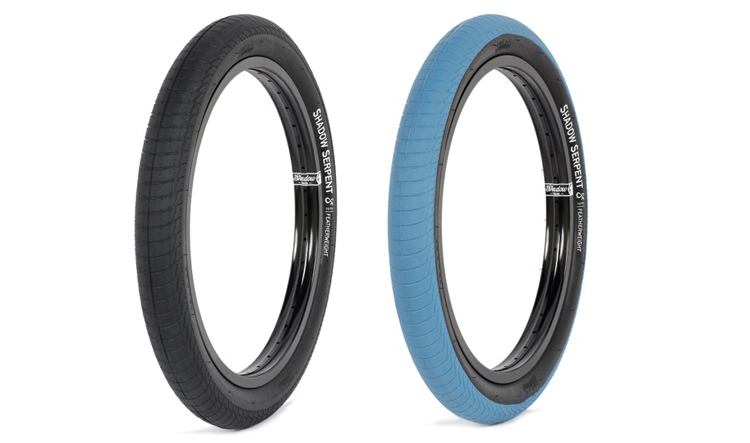 Check out more BMX Tires! The Shadow Conspiracy have released their latest round of shirts, hats, socks, hats, belts, coffee mugs, air fresheners and more available through BMX shops and mail-orders now. Above is the flipbook giving you a look at the goods, and you can get a better look over on The Shadow Conspiracy webstore now. “The latest collection of Shadow apparel is out now. This new line has all new T-shirts, long sleeve t’s, hats, belts, wallets, and more. We even have a coffee mug. Go through this new look book and find the entire new line of apparel at your local Shadow dealer or mail order.